In 2003 "Lady Lola" featuring interior layout by François Zuretti was awarded the Most Beautiful Boat In the World prize at the Monte Carlo Boat Show. We have met Shipmaster Gino Battaglia at work just before leaving Genoa, where this yacht joined the "International Yacht Charter Meeting" that took place at the beginning of May. Captain Battaglia, how did begin your passion for sea having brought you on making a so very successful career? I was born in Naples where I lived to age of five when my father, a naval engineer, decided to move to North Italy and work as Shipyard Manager at the Pietra Ligure Yard; my Grandfather was engaged in the Navy; so, by all these seeds of, it's not so strange that I begun working on board yachts, aged 14 and I still go on doing it today, aged 44. And what about your passion for? Just in very hard times to my family I knew the Shipmaster Angelo Bottaio, who at the end of my studies brought me with him for staying through the summer on board "Bravo", 30 metres in length, owned by one of most worldwide reach man in those days; an important experience in which I have learnt lots of notions in naval art field. How different were both natural and yachting worlds in those days? Well, costs were very beautiful and we could fish all day in very clean waters. People were friendly, not so as stressed as they are today and working was easier and not so controlled by marketing laws. Of course we were always warmly welcome at our arrival in harbours, because a yacht always brings business. In 1982 I was shipped on board "Nabilia", 86 metres in length, a yacht at top of technology in those days, owned by Adnam Kashoggi. Indeed, I can say that I have bounced by accident yacht by yacht, as we Captains say: in fact while mooring in Loano close to "Nabilia" I have been noted for being a trustworthy guy and soon afterwards shipped as Second Mate on board "Nabilia". The life aboard began at 7 am and finished till all hours without a pause. I must drive the numerous guests coming night and day at any hour back and forth from the yacht by a motorboat. That important experience let me make a very successful career in later. Which was your first embarkation as Shipmaster? On board Hatteras, 24 metres in length, on which we have crossed far and wide the Mediterranean Sea. From '86 to '90 I worked by an Italian owner who had two yachts, 24 and 30 metres in length respectively. 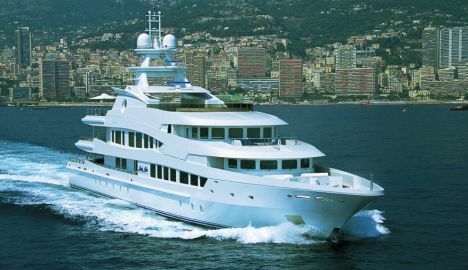 Finally I entered "King", 42 metres in length, from the Dutch Feadship Yard, used exclusively for chartering. I stay all year on board alternating between Caribbean Islands and the Mediterranean Sea. How were you first shipped on board "Lady Lola"? In 2000 I moved to Holland and supervise at the Amels Yard the building phases of "Kermit", 52 metres in length, owned by a Swiss. Right in November I drove "Lady Lola" to Miami. Do you choose the cruising destination? If yes, which destinations do you prefer? Yes of course, I organize cruising plans and I usually prefer Capri, Costa Smeralda, Corse and C“te d'Azur. This year the first stop will be The Cannes Movie Festival. On stability point of view how does this yacht behave while crossing oceans? Having already crossed the Atlantic - direct course S. Marteen - Gibraltar, 3500 miles in length - I could test that the yacht's stiffness and seaworthiness were great though her height having at first baffled me a bit. We have had 6 - 7 metres long waves and we have broken no glasses at all. What would you say to a young man wishing to make your job today? I would suggest him not considering this job a funny game but facing very carefully all the situations occurring in his career. The education is very important to Shipmasters because we must ensure the safety of both yacht and people which represent great capitals. So, apart from ability and skill at sea, seriousness and modesty are indispensable qualities to Superyachts' Masters. Last experiences as Captain: for ten years on board "King K", Amels Yard, 42 metres in length; for four years on board "Kermit", Amels Yard, 52 metres in length; for four months on board "Lady in Blue", Amels Yard, 52 metres in length. The present embarkation: "Lady Lola", Oceanco Yard, 63 metres in length. Main boat's features (project, interior layout): "Lady Lola" was built by the Dutch Oceanco Yard while the interior layout is by Françoise Zuretti. Both the designers did a very fine job, I think. Favourite Routes: Capri, Ischia, Balearic Islands, Corse, Pontine Islands. Elba. What kind of yachting innovations does impress you greatly and why? The Tech level on board superyachts is very high today. I think the zero speed stabilizers are a great invention indeed; in fact they allow a yacht in berth to avoid rolling and ever maintain her on a so comfortable trim for guests that no one glass on a very fine - set table falls down. What about your worst adventure as Captain? While crossing the ocean from Nassau to Bermuda we experienced an unexpected thunderstorm, not predicted in whichever forecast, that tried us sorely. Yacht and crew had hard way; in that event I proved how important my last experience was. And your more beautiful memory of? Indeed, the day when my son was first in hand's uniform as well as the day when I was awarded the Captain of the year 2003 prize. What do you think about your role as Captain and the yachting world in which you operate? It is a fascinating job, indeed, either when meeting very powerful people or when striking up close, respectful friendships; moreover, we surprisingly discover that this kind of people, who employs millions of people, is sometimes easier and more sensitive than us. For this reason the Master of a yacht like "Lady Lola" must show his owner how skilled he is as well as his great professionalism, seriousness and discretion. We mustn't forget owners are people who place their trust in us for quietly having a good time in safety.